The Indian National Bar Association (INBA), in collaboration with the Department of Commerce, Ministry of Commerce and Industry, and the Centre for Trade and Investment Law (CTIL), Indian Institute of Foreign Trade, organised the ‘ Bar Leadership Summit on Reforms in the Indian Legal Sector’ on Saturday in New Delhi. The occasion was graced by Satya Pal Singh, Minister of State for Human Resource Development (Higher Education), senior officials from the Government of India and several leading lawyers and professionals from the legal sector. 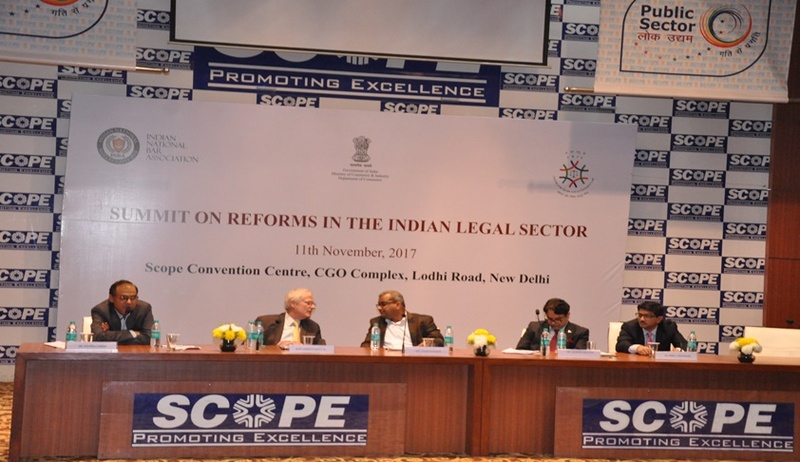 The summit explored the issues and concerns surrounding the liberalization of the Indian legal services sector. Suresh Prabhu, Union Minister for Commerce and Industry who addressed the Summit through a video message, emphasised on the growing importance of Alternative Dispute Resolution (ADR) and encouraged the legal community to increasingly make use of this mechanism to enhance ease of doing business. Satya Pal Singh, Minister of State for HRD, in his inaugural address, stressed on the importance of law as an enabler of justice and spoke on the importance of the impartiality and neutrality of the judicial system in India. He noted that the justice system should focus on the difficulties faced by the victims in particular. Kaviraj Singh, secretary-general, INBA, who introduced the theme of the summit, highlighted the dramatic changes that have happened within the legal sector in India in the last two decades and identified the three major areas which the summit should focus, namely (a) the conduct of arbitration in India; (b) reforms in the Indian legal regulatory sector; and (c) the liberalisation of Indian legal services. Subhash C Kashyap, president, INBA, who welcomed the gathering, highlighted the importance of initiating discussions on the much-needed reforms in the legal sector. Suresh Chandra, Law Secretary, Ministry of Law and Justice, stated that India has huge potential to increase the size of the legal market in India which is around $9billion at present. He suggested that reforms in this sector could tie in with the Prime Minister’s agenda of “reform, transform and perform”. Sangeeta Saxena, Additional Economic Adviser, Department of Commerce, highlighted the need for diversification of the services exports and the particular importance of the legal services sector in boosting India’s overall performance in services. RS Suri, president of the Supreme Court Bar Association (SCBA), noted that the “gulf of understanding between the Bar Council of India, State Bar Councils and the government need to be bridged” and that frequent consultations and deliberations are needed in reforming this important sector. Professor James Nedumpara, head, Centre for Trade and Investment Law, spoke about the need to introduce major challenges in the curriculum in law schools in India to enable the young Indian lawyers become ‘global Indian lawyers’ and avail the opportunities in the rising global corporate sector. The discussion ended with a presentation on the myths and realities surrounding the debate on liberalization of legal services. The summit, on the whole, agreed on the need to reform the legal sector to align itself with the new global realities in the profession. The agenda for the conference and the background paper can be referred to for more details.